It is January and we are in a whole new swing when it comes to eating. Do you love your Buffalo wings when watching football coming up to the big Super Bowl? They can be time consuming to make and heavy on the calories. 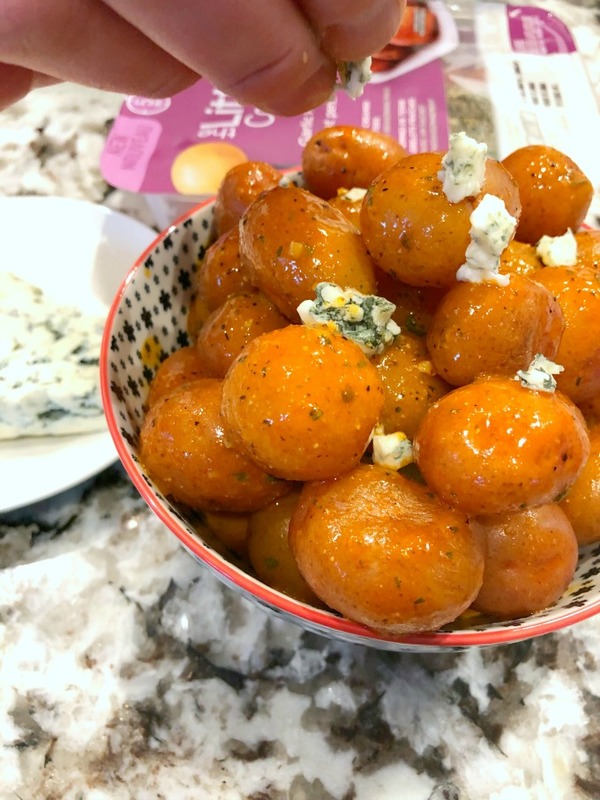 I made up these Buffalo Wing Potatoes in a matter of minutes and we dove right in while cheering on our favorite team. They made the perfect appetizer or lunch. 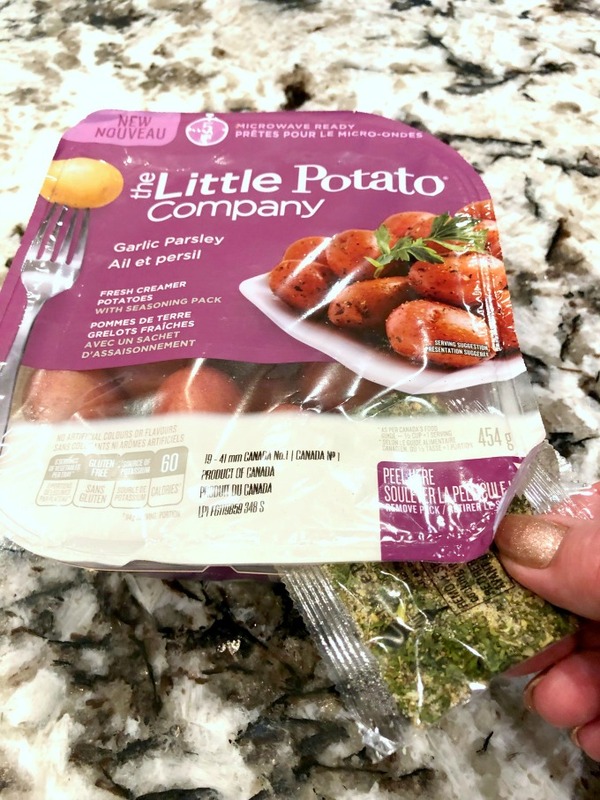 You also might like a nice and simple vegetarian option and The Little Potato Company’s Creamer potatoes are easy to use especially with their Microwave Ready packs. They literally only take 5 minutes to cook and they are made right in their BPA-free container. Heat, stir and serve, nothing can be easier for a quick lunch or for a side for dinner. 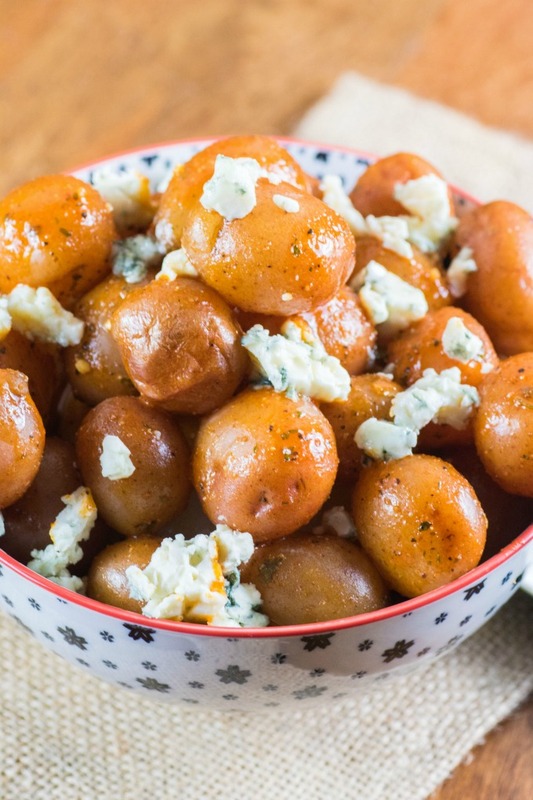 I can’t wait to serve these Buffalo Wing Potatoes to family and friends for the big game! They will be gobbled down in a minute I know. I know you want to grab a fork and jump right in! What an awesome combination of flavors!! The sauce is so easy to make. 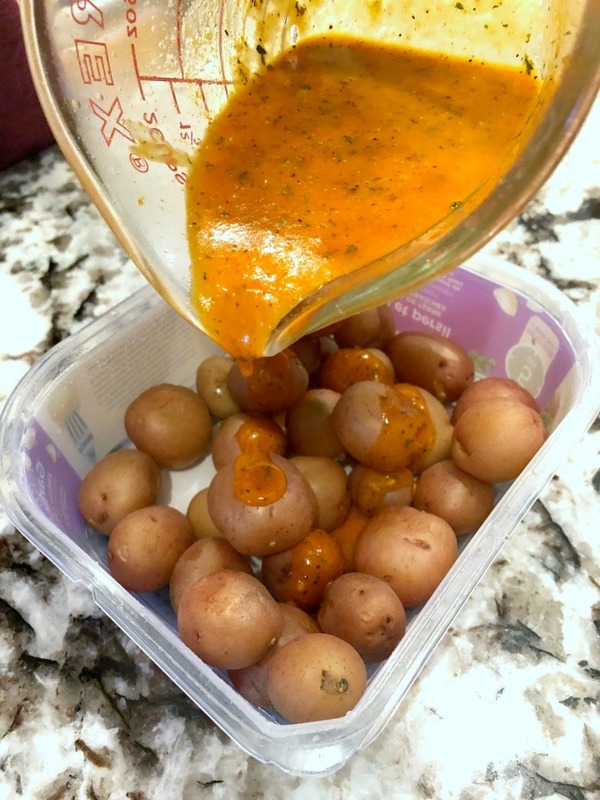 It is hot sauce, melted butter, a dash of Worcestershire and the little package of seasoning that comes with the Creamer potatoes. 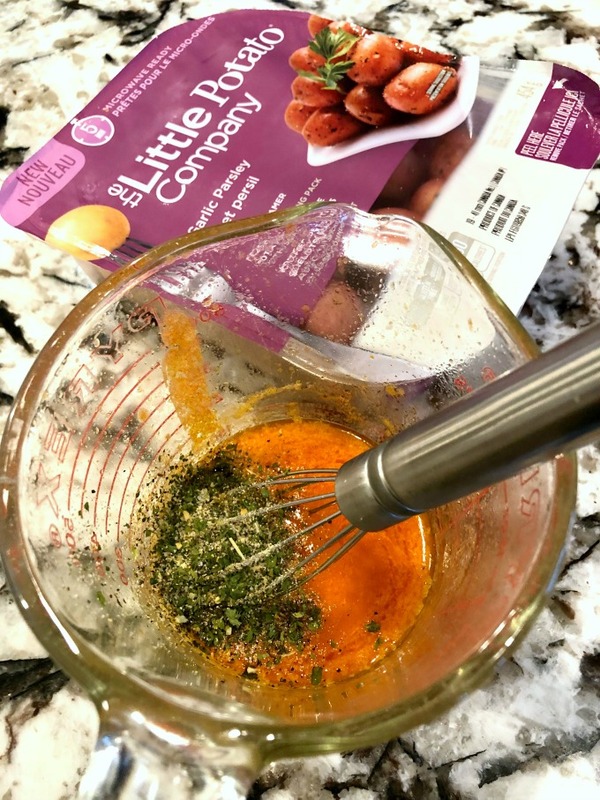 This gives them an upped flavor profile like you have never had with plain Buffalo wings and one that we all loved so much!! Buffalo wing sauce is so easy to make and you are going to love this recipe too! Only five ingredients go into making this recipe fantastic. The Little Potato Company does most of the work for you! The potatoes are packaged in convenient 1 lb. containers and are washed and ready for the microwave. The containers are designed with easy-to-hold corners and pour spouts for easy plating – ensuring you get all that good Buffalo sauce. So easy to use for any meal! 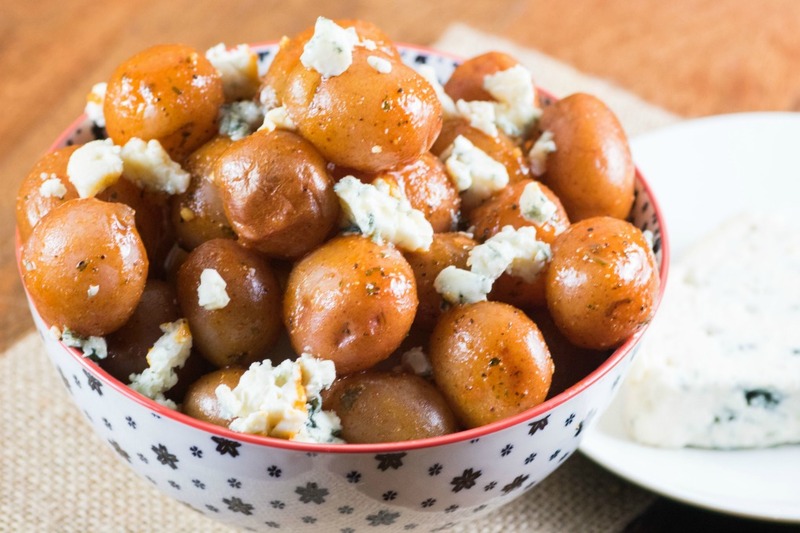 These Little potatoes would work great for a quick breakfast hash too. I have to try that this weekend for sure. You probably have most of the ingredients in the house already. 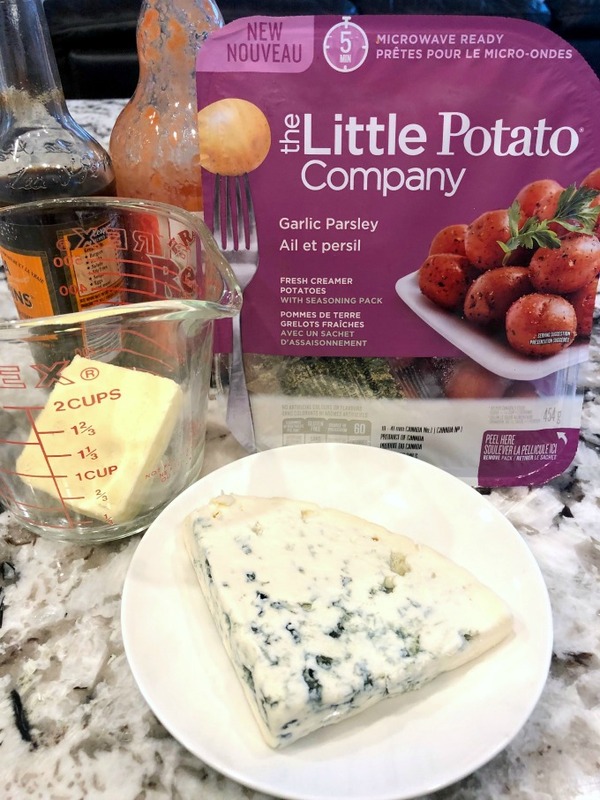 If you don’t want to add in the blue cheese you can drizzle the Little potatoes with blue cheese dressing or ranch dressing, easy peasy. Before starting to microwave just sneak that little package of seasoning out from the potatoes and set it aside. You will be needing this to make your sauce! Once the potatoes take a ride in your microwave for 5 minutes just let them rest in the container for 2-4 minutes while you make the sauce! Simply melt the butter in a measuring cup or microwave safe dish. Then add in the hot sauce, Worcestershire sauce and the great garlic parsley seasoning pack. 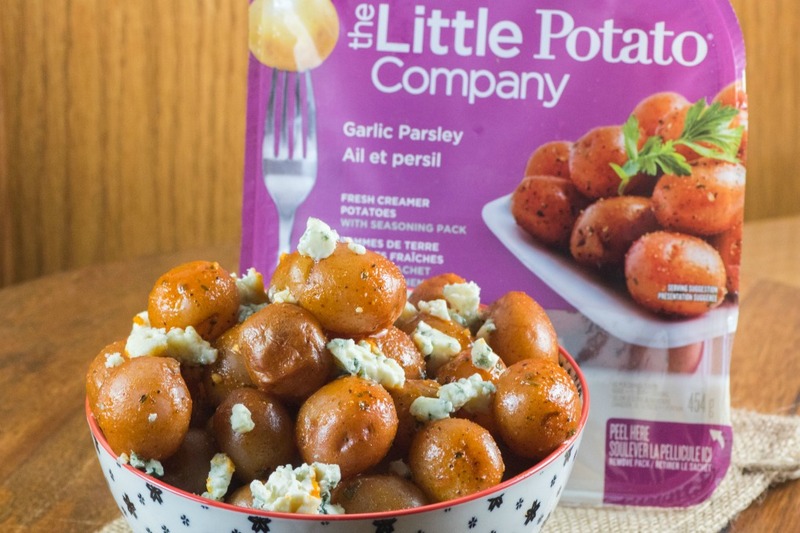 The Little Potato Company’s seasoning pack is the perfect blend of garlic parsley seasoning (you can find the full ingredients list on their website here). It is the perfect combination of flavors to add with or without the hot sauce. When are you microwaving the potatoes and just using the flavor package you can also add in a drizzle of olive oil or a dab of butter! Whatever you like! After the sauce is made and the potatoes are cooked all you need to do is drizzle on the perfectly delicious sauce. The convenience of this recipe is quite amazing. So simple, hardly any dishes to clean and minutes to pull together. Just stir to coat and you are ready to start to serve. Place the potatoes in a serving bowl and crumble on the blue cheese!! There was a little extra sauce in the package so I put that in a small dish and we served that on the side and happily dunked in each potato to get more sauce! Buttery, spicy and perfectly seasoned. This recipe has it all! In only five minutes the potatoes are cooked to fork tender perfection! Now you can get up close and personal with these Little potatoes. Are you drooling, I sure know I am as I can almost taste them again. I also love how consistently sized these Little potatoes are, making for even cooking. There is no need for peeling or even washing, they are ready to go from the store to your kitchen! They are a good source of potassium too and come in fun colorful varietals. 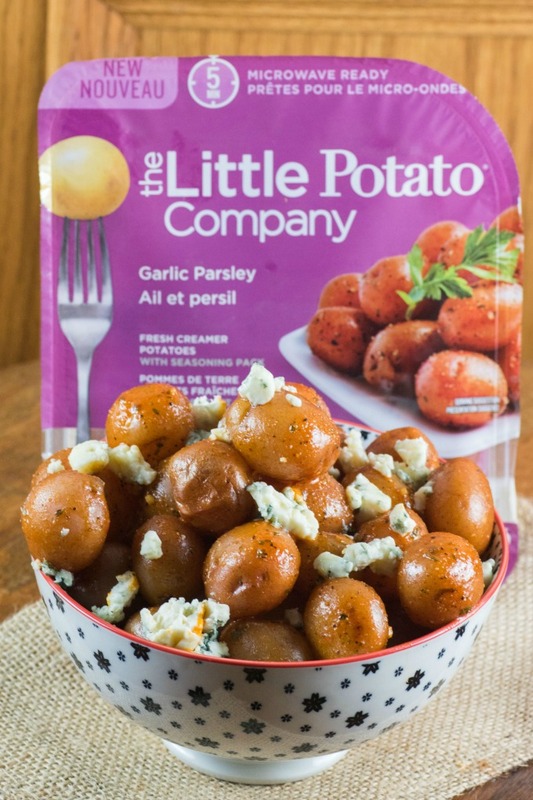 There are many benefits to using The Little Potato Company’s Creamer potatoes. This is like a copycat wing recipe but using Little potatoes. Fun eh? Fresh Creamer potatoes can be on your table even before your hungry family arrives. 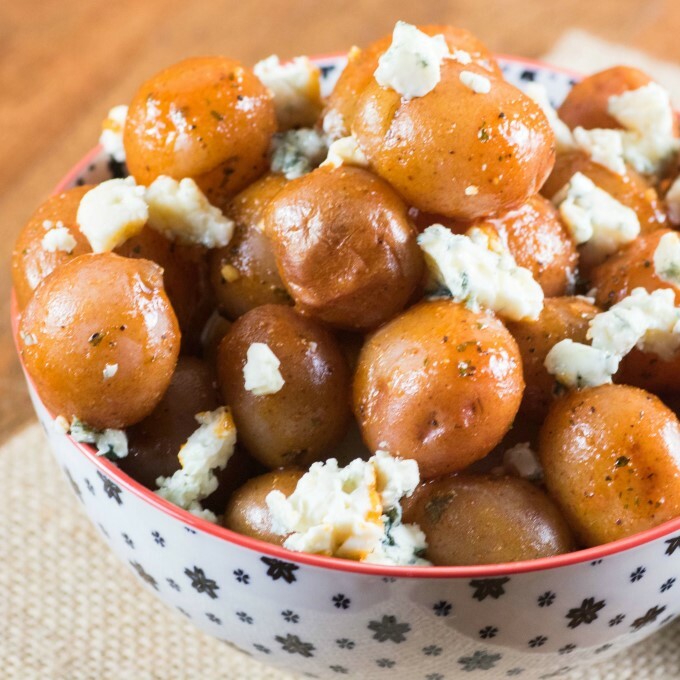 Little potatoes are fast, convenient and nutritious so they make a great addition to any meal. Besides the garlic parsley packs there are also Savory Herb and Tomato Basil. The perfect potato to accompany any entree. 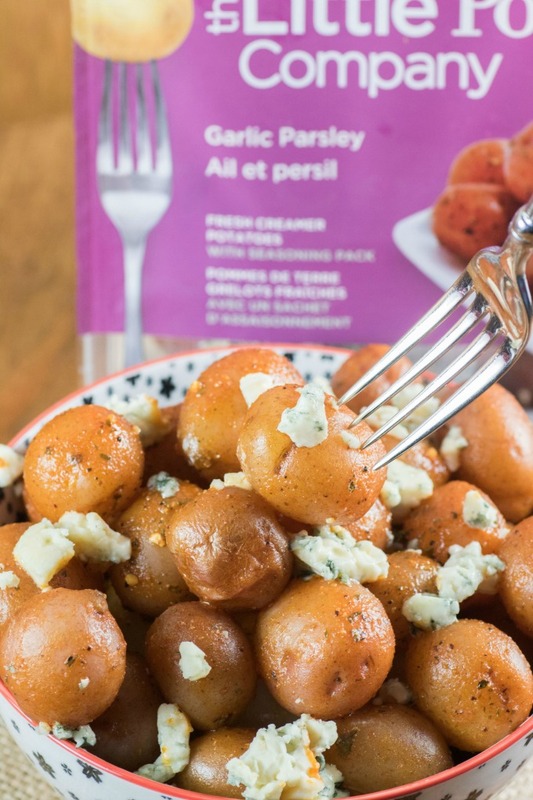 Crumbly creamy blue cheese sets off the spicy sauce in this recipe. 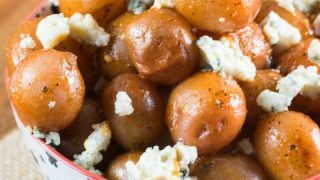 The tender Little red potatoes with velvety interiors are great with a spicy exterior. Try this easy recipe today for lunch and then make it again for game day! 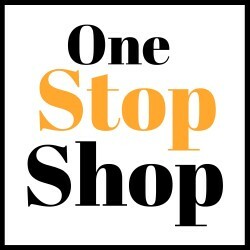 You will love the ease, the taste and the convenience. 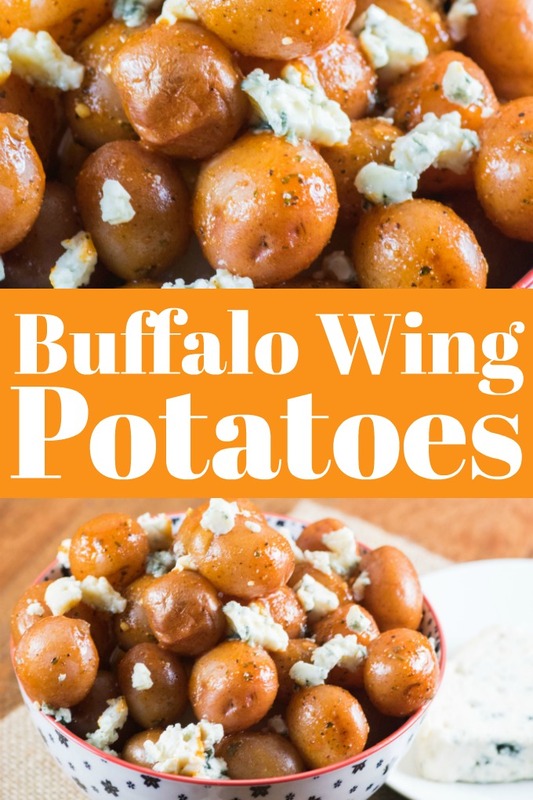 These super easy Buffalo Wing Potatoes are made in a matter of minutes and can be an easy lunch, appetizer or game day snack!! Remove the garlic parsley seasoning package from the Little Potatoes and set aside. Microwave per instructions for 5 min. While the potatoes cook, place the butter in a measuring cup or microwave safe dish. Have ready the hot sauce, Worcestershire sauce and the seasoning pack. Carefully remove the potatoes from the microwave and let them sit for 2-4 minutes while you make the sauce. That is such a tasty looking recipe. I love using those potatoes as a base to make it faster, too. I have to try this. This is such a fun “think outside the box” recipe. I bet my family would love this as they love all things buffalo sauce! I’ll have to whip these up for them. I’m positive that my family would love these. 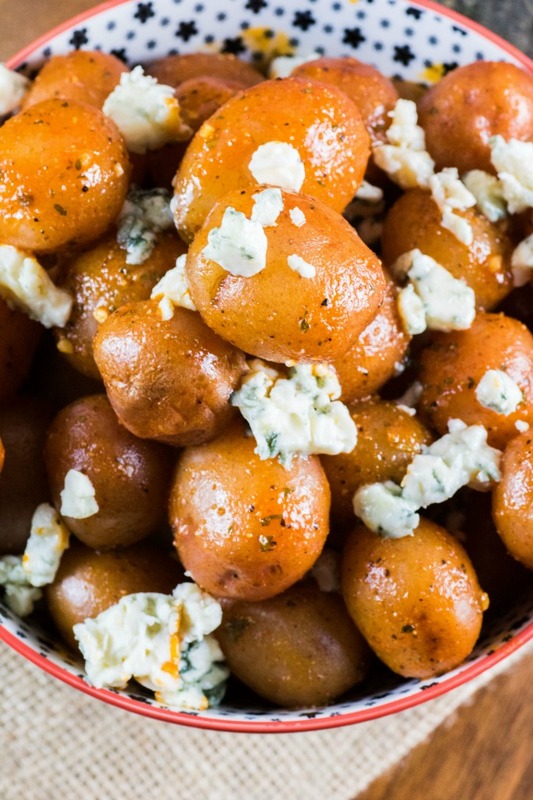 Those potatoes are just awesome for sides and appetizers! These look so yummy! I love potatoes so I need to give this recipe a try, maybe for tomorrows dinner. This recipe sounds so yummy! I love little potatoes much more than the larger ones! Those look amazing! I need to pick some up so that I can give this a try. I love those smaller potatoes. They’re the best! That sounds like an amazing recipe! So tasty! Love everything in it! This is a dinner idea that everyone in my family will love. Who doesn’t like potatoes?! And all this flavor! Microwavable little potatoes? Sign me up! I love how easy this recipe is, and it makes for perfect game watching. Quick and easy! Basically my favorite combination – potatoes are my favorite! I’d love to try them your way. 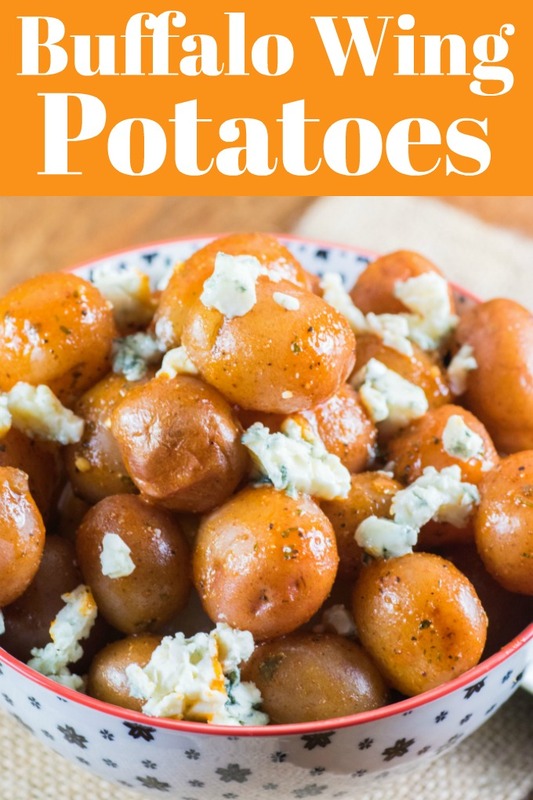 This is a great idea for those cute little potatoes. I have a few packs that I need to use up so this recipe is going to come in handy! Yum and how easy this looks. I’m going to have to see if my supermarket has this.